I cannot think of many awkward moments that compete with one with a horribly made-up bride. Such things happen, and many of you have been in such an experience. And while we cannot spoil her day and tell her the blunt truth, when we look at the bride, we can’t help but think to ourselves, “There is one look I will not use to my wedding!” And days or weeks after the wedding, the image fades away, never to return to our thoughts. Until it is our turn, that is. green, red, yellow and blue). It was applied on quite a number of occasions and the makeup pattern varied with tribe. Some say the makeup is linked with ancestral worship, so the religious bride-to-be should be cautious about her choices in this avenue and should do more research to see whether this is true and for which cultures it applies. Tribal make up is still used today, though it is more fancy and exotic, and the materials used are not the same as those used by our ancestors (which makes sense as our ancestors had less options than we do today). There are quite a number of pictures and tutorials available on-line if you are interested in this. Since not all of us follow our ancestors, what do we do? The modern African bride uses modern makeup, adapting it to her preferences. But there are some things we keep in mind. What with our skin shade, it is easy for make up to appear… caked. Makeup, after all, is supposed to improve or highlight features according to how we apply it. So if you look different after applying makeup (as in no one –can-recognize-you-different) then it is highly likely there is a problem. Obviously, we do not all have the same taste in makeup.. So if you feel like adding a dramatic flair, then do so. Just keep in mind the points listed next. First of all, get all the makeup more than a week before. You want to make sure the foundation is the right tone in advance. Keep in mind how long your wedding is. This is important because some cosmetics can become uncomfortable as time goes by. Also, while we may be fond of color in our makeup, try to avoid using an excessive array of color. Pick those that blend well. 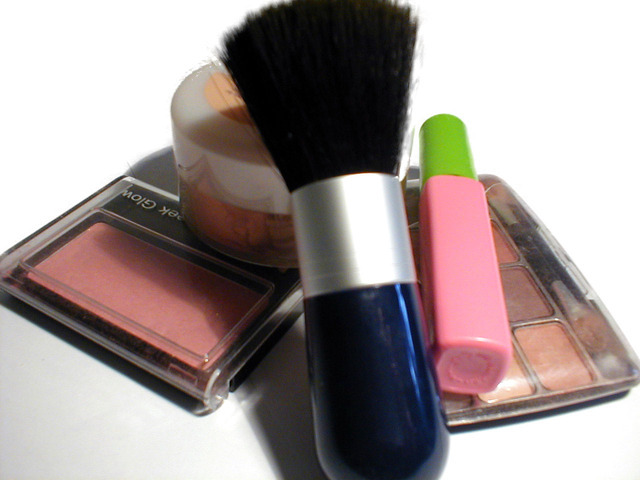 When picking makeup, there are some things you should remember. For example, consider your lipstick for the part of ‘kissing the bride’ or else a kiss might not be all you share with your husband. Your mascara should be water proof; because it is highly likely you will cry. And the list of tips goes on, but I cannot include all of them. And while makeup is important, there is something Lady Gaga said that we should: “Whether I’m wearing lots of makeup or no makeup, I’m always the same person inside.” Don’t you agree with that?